Having read all of the Alex Cross novels it is always with anticipation when I pick up the newest. This book starts out as well as any of Patterson’s prior stories. While taking characters directly from the headlines makes part of the story line more believable, I have to agree with some of the other reviewers that the mathematician as killer was hard to swallow. My problem with the book is the ending. Up until the final encounter with the main antagonist, Kyle Crane, the reader is told how precise, cautious, and masterful this criminal is and has been. The final showdown does not match what until then has been a very cunning and calculating plot to kill Alex Cross. This is not a spoiler, we all know Alex survives. Patterson, like Child, Connelly, and Crais, has become lazy in writing a book that fails to keep the reader completely satisfied. There seems to be a trend among authors of series recently to produce a book that is weak in story line. Lee Child did this in “Worth Dying For”, Michael Connelly did it in “The Reversal”, and now one of my favorite authors has followed suit. As a fan of Pike, I would expect more than reading about him driving his Jeep from place to place and watching for the bad guys. This book is light on plot, character development, and ending. Like James Patterson’s “Cross Fire”, the final showdown between Pike and Daniel doesn’t live up to what we would have expected. Daniel is able to kill Columbian drug muscle with ease yet puts himself in an amatuerish situation when finally confronting Pike. Let’s hope all these authors come back from their “rest” with renewed commitment to writing a page turner. Brad Thor writes a good story and “The Athena Project” is exactly that. A page turner with several threads that tie up nicely in the end. While the idea of “teleportation” is on the edge of believability, it is not so far fetched as one might think. My only criticism would be the “chase” scenes that were a little cliche, maybe too much like recent films. However, if you want a good read that lets you escape, then you can’t go wrong with this one. First, this is an incredibly well researched account of the politics, engineering, and human achievement that went into creating this dam. Hiltzik combines excellent documentation with a personal writing style that compels one to keep turning the page. After reading this I will always call it the Boulder Dam. Read for yourself and see if you agree! Michael Connelly is back in true form. After being disappointed in his last book, he redeemed himself with the “Fifth Witness”. It is hard to write a court room drama and do it well, Connelly has succeeded in doing just that. With shades of a Perry Mason type story and a somewhat surprising ending this is a good read and fans of “The Lincoln Lawyer” will be pleased. Someone had suggested I read Harlan Coben’s books. When I find an author I have not read I start with their first book and work forward. The reviews I read were mixed on “Play Dead” and my expectation was not high knowing this was the authors first book. It was surprising to find a disclaimer by the author telling me not to read it. My personality is such that had I had no other reason, that gave me the impetus to read this. This is not the best book I have read nor the worst. It is a good read, held my interest, a bit predictable, and I would recommend it to anyone. I look forward to reading the rest of Coban’s books and if he truly writes better, then I am in for some good reading. First, there is no relationship between the real (Ian Fleming’s version) James Bond and the character portrayed in this farce. Second, even if Deaver had used a different name for his character, this is a poorly written spy novel. There is no suspense, the villain is boring, and there are no surprises. This is probably the second worst book Deaver has written, the first being “Garden of Beasts”. I am a fan of Deaver, especially the Lincoln Rhyme series, but this falls way short of his ability. 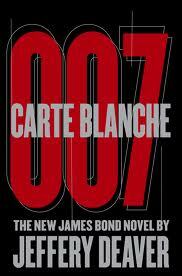 I am also a major James Bond fan and can only say Ian Fleming must be rolling over in his grave. Sorry, but this one gets two thumbs down.